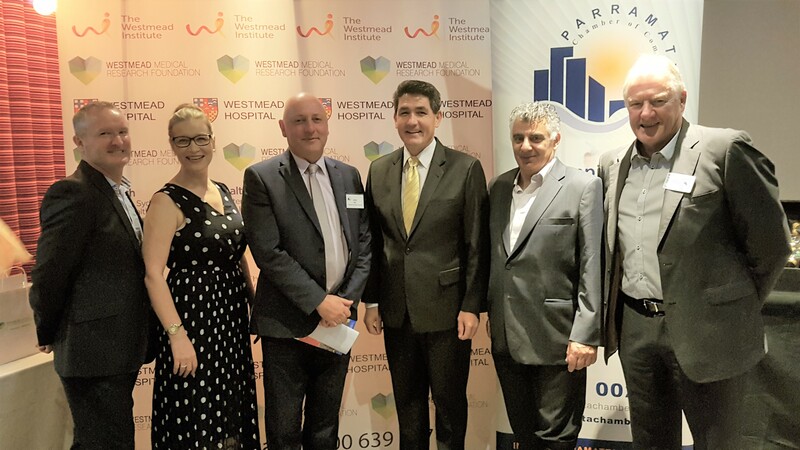 Head of Development WMRF Joe Conneely, Relationship Manager WMRF Alison Whittaker, Chamber President David Hill, State Member for Parramatta Dr Geoff Lee, Chamber Past President Michael Mekhitarian, Chamber Board Member Gary Carter. More than 120 business partners and guests have attended “Business After Five”, a networking event organised by Parramatta Chamber of Commerce at Bertonia Lounge in Parramatta. Westmead Medical Research Foundation (WMRF) head of development Joe Conneely praised the Chamber for the opportunity to host the event. Parramatta Chamber of Commerce president David Hill and business relationship manager Romina Bousimon presented a certificate of appreciation to the foundation. Members and guests have been invited by the Chamber to join their upcoming Charity Golf Day to raise funds for WMRF. This event will be held on May 8 at the Oatlands Golf Club.